The Mont Ventoux is best known from stages in cycling including the Tour de France. The ascent from Bedoin is very heavy because of the length of the climb (21.4 km), the average slope (7.5%) and summer temperatures in southern France. In total there are three climbs with a road bike as possible (a southern ascent from Bedoin, northern from Malaucène and from the east from Sault). Tom Simpson died in 1967 Tour by a fatal combination of amphetamine, alcohol and heat. Three years later, Eddy Merckx, was on his way to a victory, took off his cap passing the Simpson monument. After the finish Merckx collapsed, but in later years Merckx claimed that he played this to avoid media attention. In 2000 the much stronger Lance Armstrong gave the victory on the Ventoux to the Italian climber Marco Pantani. He would regret this gift a day later. Also in Paris-Nice and the Critérium du Dauphiné, the Mont Ventoux is regularly included in the schedule. The most recent winners are Cadel Evans (Paris-Nice 2008) and Sylwester Szmyd (Dauphiné Libéré 2009). The record time for the climb is in the name of the Spaniard Iban Mayo. He realized in the year 2004 during the Dauphiné Libéré an ascent in 55 minutes and 51 seconds. The Spaniard, broke the five-year old record of Jonathan Vaughters with 59 seconds. Before this the record with 1h 02 '09 hours was in the hands of Charley Gaul for 41 years. 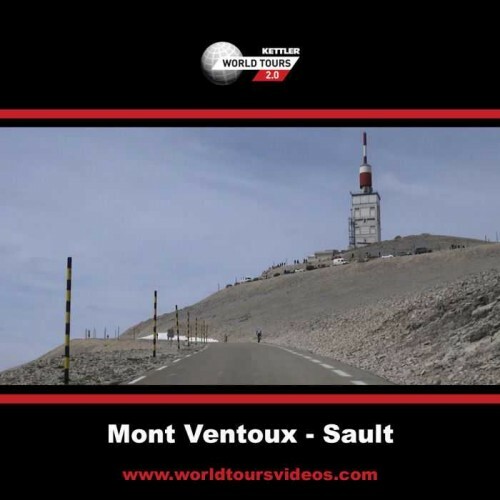 This Mont Ventoux DVD contains the climb from the south from Sault.